The storm was so bad even Peter Grimes would have stayed at home and watched BBC TV's repeat of a Steptoe film on its so-called culture channel. But a good-sized audience braved the worst Easter weather for decades to travel to Snape Maltings on Good Friday for a celebration of something more multi-cultural. 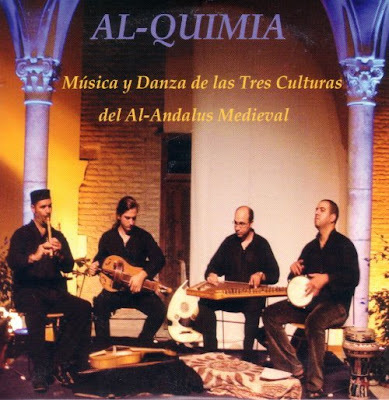 The collabaration between between early music group The Dufay Collective and the Spanish-based Al-Quimia was the outcome of one of Aldeburgh Music's pioneering artist residencies. This musical exploration of the multi-cultural society that flourished in Andalucia seven hundred years ago was a high risk project; this isn't exactly mainstream repertoire and hybrid projects such as this are rarely box-office hits. But that's not what Aldeburgh is about. Britten and Pears created Snape to celebrate the holy triangle of composer, performer and listener and on Friday evening, despite the stacked odds, the spirit of place prevailed and the vital electricity sparked from composer through performers to listener. In fairness it wasn't so much a collabration as a triumph for Al-Quimia. When the two groups played in concert the collabaration really added no more than a strengthened rythym line. But when the players of the Spanish group took centre stage the music soared, and the Dufay musicians were quite content to join the audience in silent admiration. And what a vindication of Britten and Arup Associates' acoustic vision for Snape, even from our seats at the back of the 830 seater hall the nuances of the oud, dumbek, nay flute and kanun were crystal clear. I have written here before about adventurous programming such as the celebrated concert comprising an Ockeghem Mass and a Mahler symphony in Berlin in 2000, while none other than Philip Glass has said that world music is the new classical. So, now Aldeburgh Music has seen what electifying musicians Al-Quimia are, please can we have a concert with a set by them in the first half and the Britten-Pears Orchestra playing Messiaen's might multi-cultural Turangalila Symphony in the second? Yes, I know there are boring problems like the platform lay-out. But I live close to Aldeburgh and will happily help swap the oud for the ondes Martenot and oboes in the interval. Now see the art of the mosque.